This is not a rant about the people that want to take us back to that era through politics or beliefs, but a praise to the ones that can take us back in a highly designed, playful way. 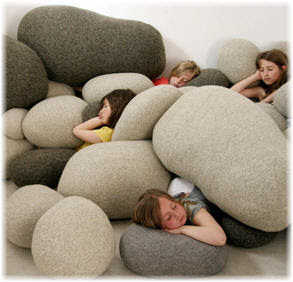 This is about a very nice, very simple and very versatile piece of furniture: "The Livingstones". 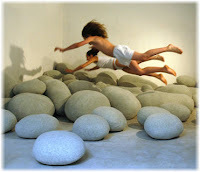 The Livingstones are a set of cushions (some of them of the size of a sofa), that can be seen as oversized pebbles, and as such can be arranged and rearranged using their different sizes and shapes to get different effects. Made of 100% virgin wool and with an alternative line in polar fleece for those allergic to wool, they are relatively easy to maintain and available in more than 10 sizes and shapes. From the 11 colors available, ten are 'natural stones' ones and there is just one out of the eart spectrum: a bright red that allows any set to have a special touch. As you can see here, depending on the arrangement they can give a room a contemporary and minimalist look or can just make of a corner a new playground for your kids. 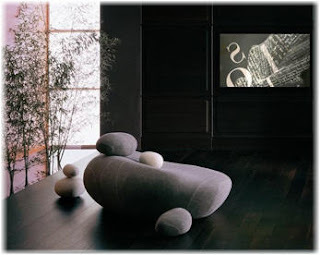 In 2006 the company (Smarin Designs) came up with a second line -this one conceived for exteriors-, that instead of wool uses a neoprene cover and a waterproof foam for the foundations. The company behind the idea is based in Nice and prices and patters are available by request. No doubt, this is another thing for any 'wish list' when it comes to interior (and exterior) design!